So…. why do you get plantar fasciitis? You might be wondering why your heel hurts this week. And why was everything OK last month or last year? There are seven main risk factors that increase the likelihood of plantar fasciitis. They are discussed below. Perhaps you always had one or two of the ‘risk factors’ and got by without pain but then something new came into the mix. Sometimes you can identify the event, like a very long walk or a bad pair of shoes. Sometimes though, it is nothing particular – just the tiny straw that broke the camel’s back. 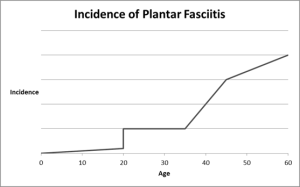 episodes of plantar fasciitis usually become more frequent, increase in severity and take longer to recover from. This is due to changes in the collagen in your body. Collagen is the substance that gives connective tissues (like the plantar fascia) its strength, some of its stretch and its ability to bounce back. As you get older the collagen becomes weaker, less stretchy and less bouncy. This change starts to occur in your mid-thirties, just around the time that the collagen in the skin starts to allow wrinkles to develop. You may also have noticed that as you have gotten older, the arches in your feet have lowered. Collagen is implicated here as well as the tissue that binds the foot bones into a tight unit, slacken and allow the bones to move apart a little bit more. As the arches lower, they also lengthen, which causes the plantar fascia to be stretched over a longer distance, causing strain. 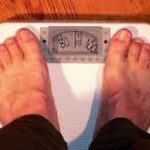 Weight and Why do you get plantar fasciitis. Our feet obviously carry the weight of our body. Excess body weight puts extra stress through the bones, muscles and ligaments and creates more pressure that will push the arch down further into a flattened position. The plantar fascia is the structure that is mostly responsible for resisting this flattening. Women quite often experience plantar fasciitis during pregnancy. This is partly due to carrying the extra weight of a developing baby. Also, a hormone called ligament relaxing hormone is made towards the end of the pregnancy for the purpose of relaxing the ligaments around the pelvis in preparation for child birth. However, it doesn’t just affect the ligaments around the pelvis but also the ligaments in your whole body including the feet. This, coupled with being heavier than usual, causes the foot arches to flatten. They do not automatically return to their previous height which can cause the feet to remain flat thereafter. Wearing an orthotic support during the last half of each pregnancy can be protective of causing this ongoing foot problem. A flat or pronated foot is longer than one with a high arch. Therefore, the plantar fascia of a flatter foot will be stretched over a longer distance than it is in a normal or high arched foot. This puts tension and an elongating pull through the tissue of the fascia. All soft tissues, at some point, split up into multiple fibres and punch into the bone to make an attachment. At these attachment points, inflammation can occur and this will cause pain. In plantar fasciitis, this is usually underneath the heel or in a longways stripe through the arch. Tight calves can also be a major factor in moving too much stress onto the plantar fascia. 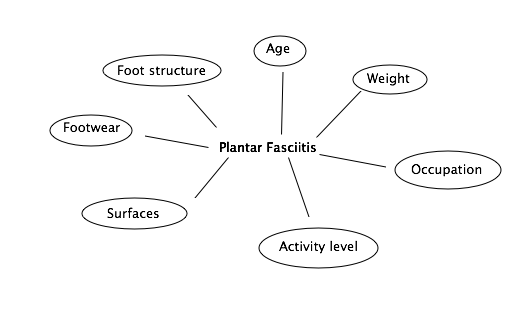 Occupation and how this ties in to Why do you get plantar fasciitis? Occupations that involve being on your feet all day, whether it be standing still or walking around, increase your likelihood of getting plantar fasciitis. We are more likely to see a retail worker, teacher or chef than a bunch of accountants with sore feet. The types of surfaces that you stand, walk and run on can affect your feet. Hard surfaces, such as concrete and tile floors, will not compress when you walk on them. This leaves your body to internally absorb the shock of your feet hitting the ground, through your bones, ligaments and muscles. This is in contrast to standing or walking on carpet or grass where there is a slight compression of the surface underneath the foot. This allows the impact of the foot striking down to take a longer time. Deceleration forces are reduced and the fascia’s extension to full length is more gentle. This is a common reason why do you get plantar fasciitis after moving from a home with a wooden floor to one with a concrete slab, for example. Poor footwear choices can contribute to the likelihood of developing plantar fasciitis. Wearing absolutely flat shoes, including thongs and ballet flats, is the main culprit. Other footwear risk factors include the hardness of the sole of a shoe, an improper fit and how much support the shoe provides for your foot to reduce rolling in / dropped arch / pronation.. The beginning of plantar fasciitis is often associated with a change in physical activity level. This is usually either an increase in the amount of exercise or a change in the type of exercise. Sometimes, it is not actually exercising that may cause the pain. People with plantar fasciitis often complain of pain when pushing a heavy weight uphill, for example a shopping trolley up a ramp, and when walking on sand barefoot along the beach. Now that you know Why do you get plantar fasciitis?, if you have heel pain, seek treatment from a podiatrist sooner rather than later as the condition can be harder to manage when it becomes chronic. At our Podiatrist Brisbane clinic, we can offer immediate pain relief as well as long term correction. We anticipate that we can halve your pain level within an hour of your first treatment by using an inexpensive bracing technique to reduce the pull on the fascia. So, don’t delay, seek treatment for plantar fasciitis today.